Now and then you meet a secondary character in a story you love, and yearn to find out more of what happens to him, especially if he’s in dire need of an HEA of his own. Otis Tucker, who was one of Barry’s “This isn’t Mr. Right!” dates in The Match Before Christmas, really deserves some happiness. 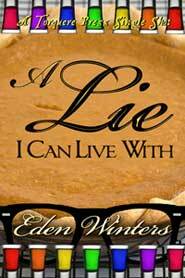 Eden Winters has brought him to the forefront in A Lie I Can Live With. The Dotted Line Has Been Signed!!! Settling the Score gets love from Mrs. Condit's! Diversion - We have a blurb!